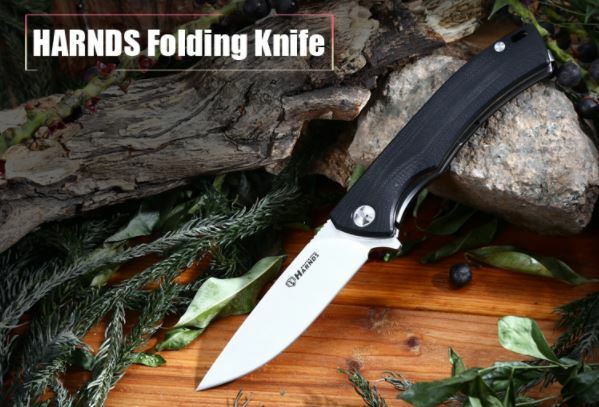 Best Chinese Knives: Harnds Talisman Knife - Finally a Ganzo Knives Rival? Harnds Talisman Knife - Finally a Ganzo Knives Rival? Ganzo Knives are (rightfully) ruling the budget knife segment as of now, and there is one reason for that IMO - value. They may not be the cheapest (Sanrenmu) or the perfect quality ones, but their value is undisputed. And yeah, they put their own logo on the blades and try to make a design a little different, so that plays in their favor. But now there is a new kid on the block. Harnds have been around for a while, but never did anything that will step them up from other budget blades (Enlan, Inron, Tonife, etc), until now. They actually took the time and designed a flipper knife from scratch, that features rounded G10 handles, ball bearings in the pivot and AUS-8 on the blade. I also appreciate their honesty (cause they didn't just put D2 mark, like many do these days), and if they heat treated it right, it can perform very well. Anyway, I just ordered one from GearBest (they are having a flash sale for only $27.99), and will do a review when it will reach me. I really like everything about this knife, except the size. If the small version of the Ganzo G-753 will sell well then I hope they'll make a small Talisman, too. I didn't notice that the F753M1 didn't have a backspacer until I read your comment. Good observation...I don't think I'd like it without one either due to the size of the lanyard holes. That's a shame...I was looking forward to buying one. If you suggest that idea to them, they might actually listen, like Ganzo do in many cases. The F753M1 is a start in the right direction for them, I'm sure it will sell well and we'll see more mini models of Ganzo and hopefully other popular knives. The G727 is probably my favorite Ganzo so far...I just fits perfectly in my hand and is a super comfortable carry. I contacted them a few times months ago asking them to make it with CF scales...still waiting! Also...I hope they start using some other colors in their G10 variants like they used to in the G704. Yeah, I contacted them about 6 months before they made the F756, asking them to make a BM940 Style knife. They take their time with the new models, I hope they will listen to you and make that model. @hovan-A-sec If you want to add a lanyard but don't want to wrap it around the whole knife you could just mod your scales like on the Protec TR-2. Remove the material from the scale around the lanyard hole with a file, sand the edges and check if the steel liners are chamfered. Wow, that is a good looking CF clip! Thank you. I still have to get my hands on some longer clip screws but the sizes are rather awkward so that might take some time. Awesome bro, please update when you get yours. I will definitely do a review when I'll get mine :). Nice review, I definitel need a smaller version of the Talisman if they ever make one. Btw, I don't think the detent arc so close to the edge will cause any problems, for me it was rather weird that they removed the "nose" from the blade's root (the Sebenza bump) and now there's only little room for the stop pin. It's still working well but I guess with its ball bearings it could have been a nice front flipper. Oh, on my copy the lanyard tube rattles a bit, how's that on your copy? Thank you, Endre. Lanyard tube on mine feels quite secure for now. From what I've read so far, it seems that quality differs a lot from piece to piece. Also I have second hole in the blade near the pivot. Do you have one on yours? Indeed, mine has the same hole. I guess it's there for manufacturing purposes, maybe when they do the main grind. My SRM 710 has a "useless" hole and the Kershaw Chill, too. Besides the not anymore rattling tube the knife is really well made.